A thin sliver of Mimas is illuminated by the Sun, and the long shadows caused by its rough Surface are showing off its many Impact Craters: the true indicators of the moon's "violent" past and history. The most famous evidence of a collision on Mimas (which is approx. 246 miles - such as about 395,89 Km across) is the Herschel Crater, that gives Mimas its kind of "Death Star-like" appearance. 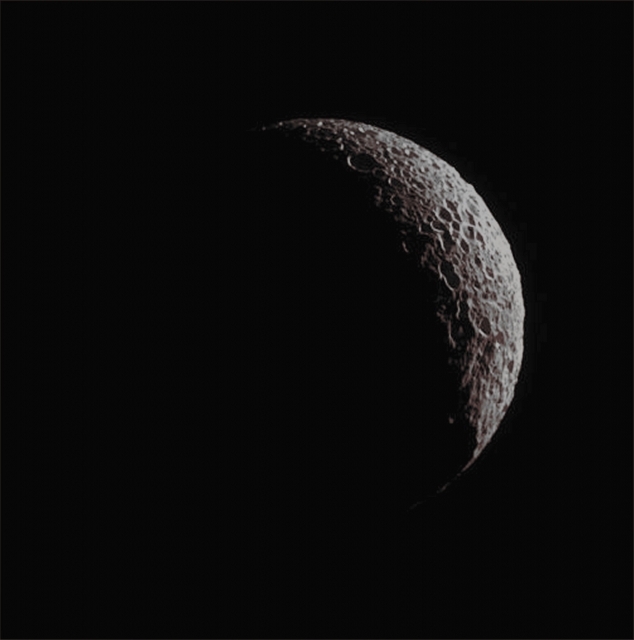 This view looks toward the anti-Saturn Hemisphere of Mimas; North is up and rotated 40� to the right (Dx). The image was taken in Visible Light with the NASA - Cassini Spacecraft's Narrow-Angle Camera on May, 20, 2013 and it was acquired at a distance of approximately 100.000 miles (such as about 160.934 Km) from Mimas, at a Sun-Mimas-Cassini Spacecraft, or Phase, Angle of 130�. Image scale is roughly 4000 feet (approx. 1,219 Km) per pixel. This frame (which is an Original NASA - CASSINI Spacecraft's b/w and NON Map-Projected image published on the NASA - Planetary Photojournal with the ID n. PIA 18285) has been additionally processed, contrast enhanced, magnified to aid the visibility of the details, Gamma corrected and then colorized - according to an educated guess (or, if you wish, an informed speculation) carried out by Dr Paolo C. Fienga - in Absolute Natural Colors (such as the colors that a human eye would actually perceive if someone were onboard the NASA - Cassini Spacecraft and then looked outside, towards the Saturnian moon "Mimas"), by using an original technique created - and, in time, dramatically improved - by the Lunar Explorer Italia Team. Different colors, as well as different shades of the same color, mean, among other things, the existence of different Elements (Minerals) present on the Surface of Mimas, each having a different Albedo (---> Reflectivity) and Chemical Composition.